Congratulations to Fresh! 2006 finalist and COUNTER stockist Lucy Hearn on her selection as one of 19 finalists in the prestigious Gallery Funaki International jewellery award opening Tuesday June 3. Lucy appears in such illustrious company as Karl Fritsch, Kiko Gianocca and Mirei Takuchi to name a few, and is in the running for the $5000 prize presented to the winner on the opening night. Funaki say of the event " we aimed to find jewellery that engaged with the notion of transformation...It could be through the presentation of a familiar material in a new and unexpected way, challenging our expectations of it" certainly applicable to Lucy's trademark use of plastic beads and enamel in her jewellery. 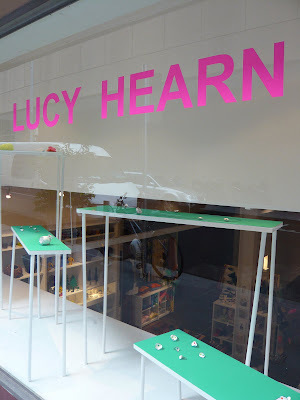 You may have been lucky enough to catch some of Lucy's work in her fantastic enCOUNTER exhibition earlier this year, and can still find her latest range within COUNTER at the moment. Opening night Tuesday 03 June 6-8pm.